In FY2016, we significantly improved our deep sequencing based assay of ribozymes by demonstrating an exhaustive analysis of all single and double mutants of a self-cleaving ribozyme (>10,000 mutants). This technical milestone paves the way for more extensive and practical applications of our methodology to engineer synthetic riboswitches to control gene expression in mammalian cells. We also continued to push other efforts to design synthetic functional nucleic acids including bacterial riboswitches and in vitro evolution of ribozymes. We have been collaborating with two groups at University of California, Davis to develop a novel MRI probes to monitor gene expression in living animals. Ribozymes are RNA molecules with catalytic activity. 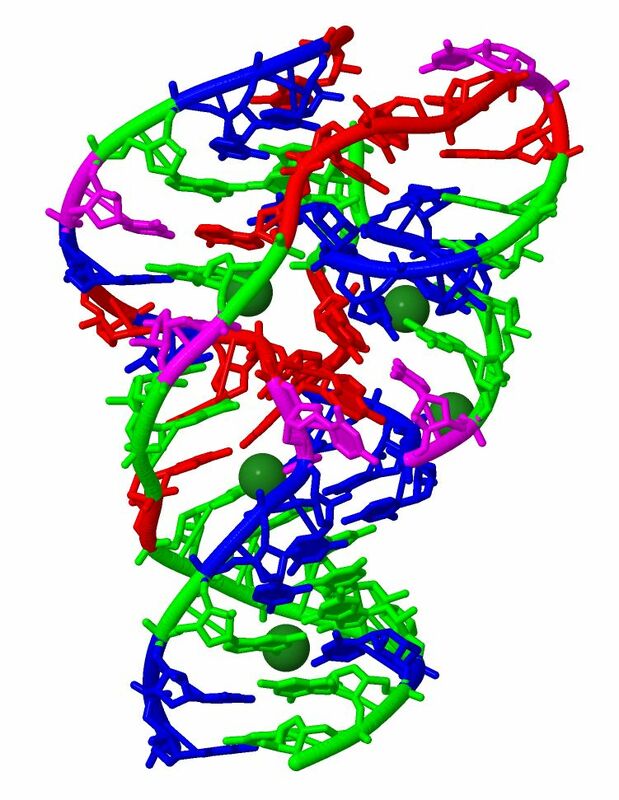 Natural ribozymes with RNA cleavage and splicing activities have been discovered and they are believed to play important roles in gene regulation as well as early evolution of life. Moreover, we and others have successfully engineered ribozymes to control gene expression in living cells, with potential future applications in biotechnology and medicine. However, characterizing ribozymes involves tedious preparation of many ribozyme mutants or variants and their activity must be measured individually. A method that allows efficient and quantitative characterization of many ribozyme variants would greatly deepen our understanding of ribozyme functions and our ability to engineer better ribozymes. To that end, we developed and reported a high-throughput ribozyme assay strategy based on deep sequencing in FY15. This year, we extended our methodology to exhaustively analyze >10,000 mutants of a small self-cleaving ribozyme found in the rice genome (Figure 1). The mutants include all possible single and double mutants of the 54-nucleotide sequence. The results provided, for the first time, quantitative effects of all single and double mutations of a ribozyme, revealing its functionally critical nucleotides and mutational robustness and sensitivity. Riboswitches are chemically responsive gene regulatory elements that use RNA for both molecular recogniation (sensing) and gene regulation. Synthetic riboswitches have promising applications in biotechnology and medicine by enabling cells to respond to arbitrary chemical cues to control any genes of interest. In FY2016, we continued our efforts to develop riboswitches that respond to a small molecule inflammatory signal for potential probiotics applications. Specifically, we successfully isolated an RNA aptamer for the target small molecule and performed chemical analyses (e.g. binding asssay). We also developed riboswitches that function in the predatory bacterium Bdellovibrio bacteriovorus which is known to predate a wide spectrum of gram-negative bacteria, including pathogenic strains. Data are being collected for publications in the near future. Ribozymes serve as an attractive platform for asking some basic questions in evolution. By combining an in vitro transcription of DNA into RNA by RNA polymerase, and a reverse transcription of RNA into DNA by reverse transcriptase, one can "evolve" a ribozyme in a test tube and study how mutations affect the evolution of the ribozyme populations. We are specifically studying how the mutation rate (controlled by Mn2+ concentration) of the ribozyme affects the distribution of the ribozyme mutants in the evolving populations. A promising application of ribozymes referred to in 3.1 above is to control gene expression in mammalian cells. We applied the deep-sequencing methodology to assay a large number of ribozymes to design "aptazymes" whose self-cleavage efficiency is controlled by a small molecule bound to an RNA element called aptamer. These aptazymes were then inserted into the 3' untranslated region of a mRNA so that the cognate gene expression is regulated by the small molecule. 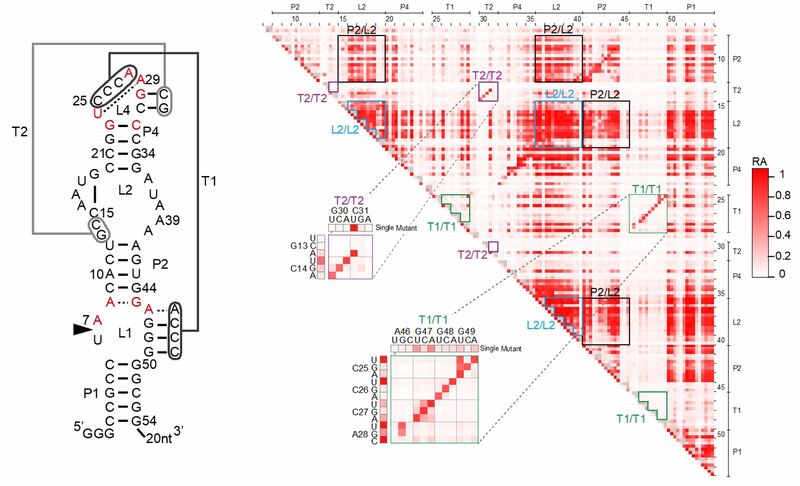 Kobori S, Yokobayashi Y. High-throughput Mutational Analysis of a Twister Ribozyme. Angew Chem Int Ed 2016; 55: 10354-10357. Yokobayashi Y. RNA Devices That Control Gene Expression. Seibutsu-kogaku Kaishi 2016; 94: 190-193 (invited review in Japanese). 横林 洋平, 「RNAによる遺伝子発現制御デバイス」, 生物工学会誌 2016; 94: 190-193.